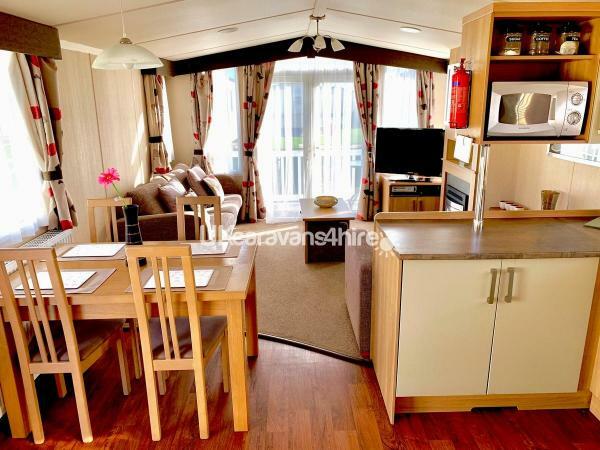 Lovely caravan on a fantastic award winning 5 STAR Haven holiday park. The caravan is located 2 minutes walk from the lovely sandy beach, 1 minute walk to the kids play area and 5 minutes from the entertainment area. Nearly new! 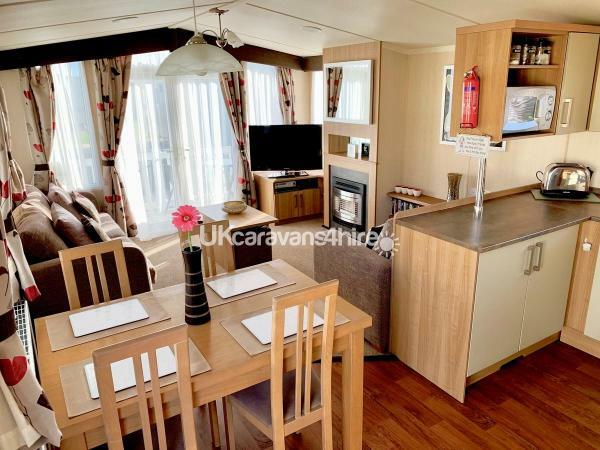 Swift Bordeaux Exclusive 2 bedroom 6 berth 38x12 contemporary, stylish, innovative and spacious home has all the features for modern living. The luxury lounge with flat screen TV, DVD player and Xbox 360 console, comfortable sofa's and feature windows and patio doors onto front decking. A striking modern kitchen with large integrated fridge/freezer, separate dining area, lovely comfortable king size bed in master bedroom with en-suite with room for travel cot (travel cot also included if you should need it) and a twin bedroom with two comfy beds that can be pushed together if necessary, pull out double bed under large sofa in lounge, family practical bathroom with large shower to complete your holiday home experience. 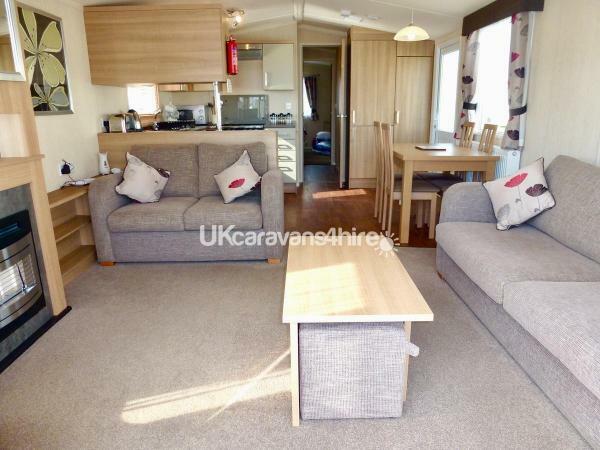 If you were to book this caravan through Haven it would be a 'Platinum' grade but by booking with an owner you get so much more, this is a real home from home. No pets or smoking are allowed in this caravan. Haven do not generally allow singles groups consisting of all female or all male parties and all lead guests must also be aged 21 or over. Please email/contact me through messages for further information including availability. 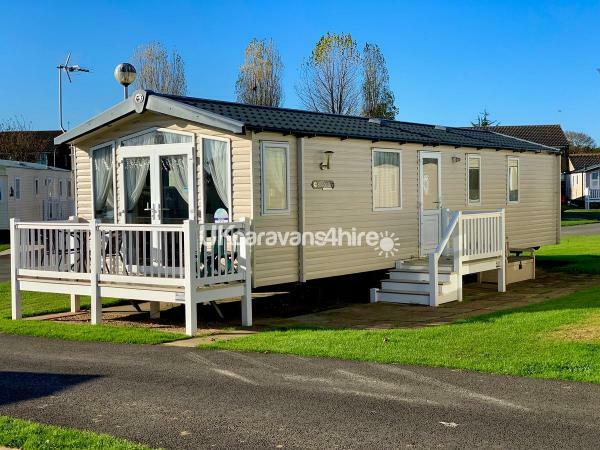 The site is a Haven holiday caravan site: There is a great entertainment club with bars and nightly evening entertainment featuring groups, dancers, comedians etc. There are bingo sessions, amusement arcades, bowling, a crazy golf course, bouncy castles and an outdoor swimming pool. The costume character Bradley Bear and his friends provide amusement and fun for children of all ages. There is bike hire, indoor pool with flume slides. 9 hole 3 Par golf course, The Mash & Barrel restaurant provides good meals in comfortable, modern surroundings and has a well-stocked bar. There is a laundrette and convenience shop and food store. Please contact via messages for enquiries or call/text 07769321652 for advice if required. 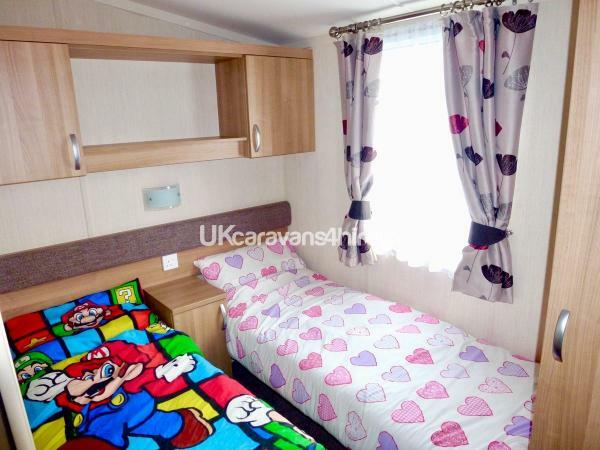 For our first trip to the seaside with the kids we struck gold hiring this caravan. There was enough space for the four of us, the wash facilities were good, the living room offered the perfect space to relax in the afternoon (and for our son to learn monopoly) and it was the perfect space to go out and explore our surrounds. Would highly recommend to anyone looking to stay with kids. We stayed in this caravan for 1 week with our 1.5 year old daughter. We found the accommodation to be very clean and had everything we needed for our stay. The main bedroom is lovely and spacious with generous amounts of storage and a nice dressing table. The location of the caravan is ideal as it is very close to the beach and only a short walk to the entertainment complex. The owner Ian was very responsive and professional in terms of booking. He came and met us once we had arrived and very kindly brought some books for our daughter to borrow. We had a great week here and wouldn't hesitate returning! 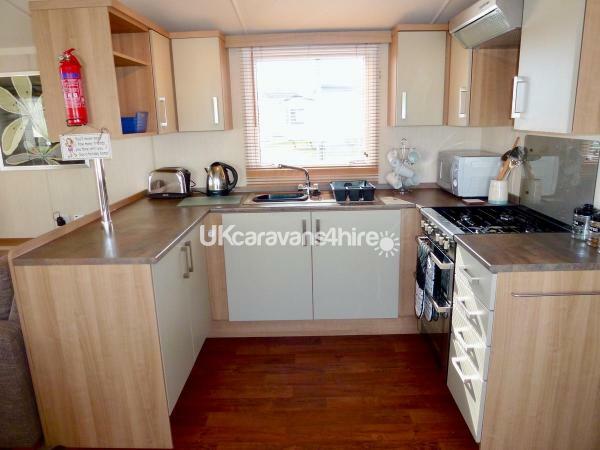 Lovely little caravan on a fabulous corner plot with plenty outdoor space and parking. It is close to the play park and only a few minutes walk to the main complex (close enough to walk but not so close that you can hear the disco). The owner keeps lots of board games DVDs and an Xbox with a good selection of games for guests to use. 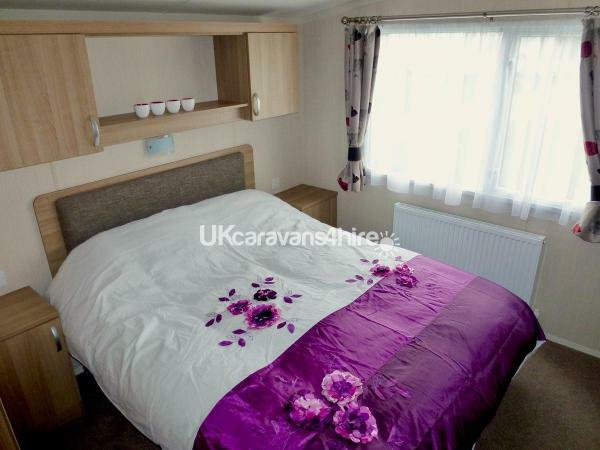 The caravan is well cared for and presented well with lovely comfortable furnishings. We stayed with our 4 daughters aged 7 -14 and found the caravan was spacious enough for us all as there was additional storage and a second wc to the main bedroom. 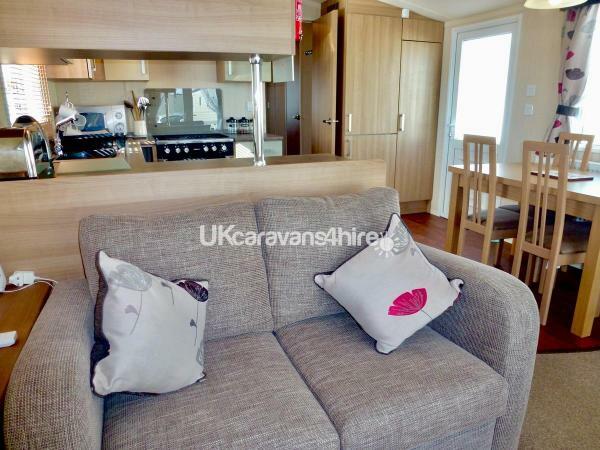 We travelled with family who booked the caravan next door (from the same owner) which was an added bonus as its difficult to get accommodation guaranteed close together when booking with Haven. I would highly recommend this caravan. Thanks for your review, I look forward to welcoming you to our caravan again in the future.